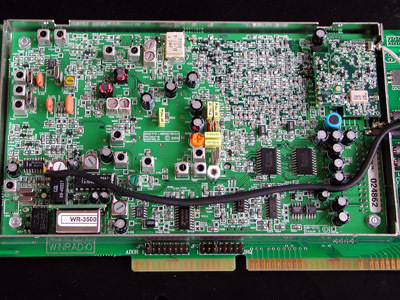 The Winradio 3500i is a receiver for 150 kHz to 2600 MHz, designed as an ISA PC card. The receiver is controlled via Windows software. The external version of the 3500 has a discriminator output off-factory, but the 3500i needs a modification. 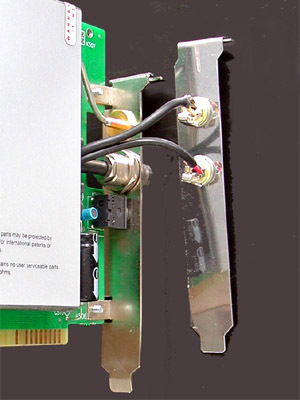 The receiver is located under the the lid. The owner wanted discriminator outputs for narrowband as well as wideband FM (FM-N and FM-W). 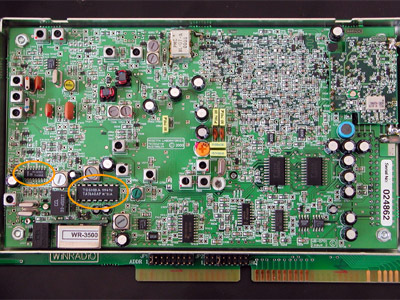 The 3500i uses an SMD MC3372 for FM-N, with the baseband audio on pin 9. 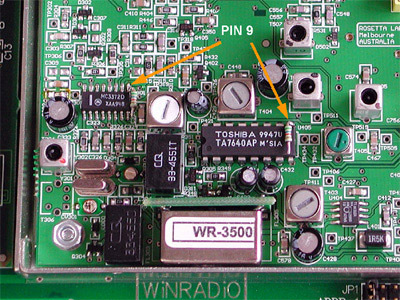 For FM-W, the receiver IC is a DIL TA7640, with the unfiltered audio at pin 9 as well. At both IC's, 5.6 k resistors are soldered to pin 9. The resistors are fixed to the IC's with a drop of glue from a glue gun. The resistors' other leads are connected to the inner conductor of two pieces of shielded cable. The braid of both cables is soldered to the metal shield of two coils nearby. Two 3.5 mm chassis jacks are mounted on a cover plate and connected to the leads running from the receiver. 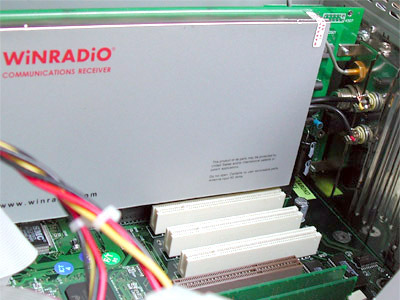 After closing the receiver lid, the Winradio can be mounted in the PC.